“A narrative that spans 16 years and four cities, Varun takes a trip down the memory lane and opens up his world to you, describing the intricacies of shouldering the burden of expectations his family has on him and yet coming up triumphant, the importance of having a friend’s shoulder to cry on when you are down and out and the perks of being a soldier’s son. Join the emotional sissy that he calls himself; in his roller coaster ride as he tries to unlock the eternal mystery that is LOVE. In a romantic relationship that has gone kaput, with two women who are as different as chalk and cheese, he finally meets the love of his life. But do good things come the easy way? Before that, he has to bear the gut wrenching blows of the henchmen of a local Corporator, physically assault a senior HR leader in his company, almost lose his life in Dharavi and then take on the might of a powerful landlord turned realtor – all though at different stages of his life. I received the book from the author in exchange for an unbiased review. The title of the book and the blurb reveal quite a lot about the book. In that sense, it can be said that the story seem predictable. But, the way the story unfolds is where the charm of the book lies. 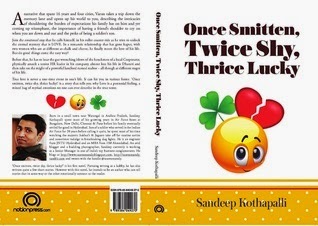 You can safely assume that the author shares the story of his life where he falls in love 3 times and only the 3rd time he meets the real love of his life. The book is quite bulky – it has to be- for the narration span over 16 years. That is quite a time to be covered in a single book. Plus there are 3 love stories, albeit 2 unsuccessful. The book is divided into three phases, each revolving around the 3 different phases in life. And love happens to him in all the three phases. There are a number of characters at play. I read the book quite slowly, so I found each one of them nicely sketched and depicted. It was as if, I could imagine everything in my mind. At times, it was monotonous – there were unimportant things explained in detail. Otherwise, there is a lot happening in the book, which keeps the readers engaged. Lahiri and Sasha were the two characters that stayed with me, even when I was done with the book. There was something inspiring about these two characters that made them special to me. In the end, I realized that it is not just a love story; there are so many underlying themes which gel well that make the story entertaining and interesting to read. While you read this book, you are likely to take a few trips down the memory lane as there are quite a few things that most of us can relate to. Thank you for stopping by. Cheers! Your comments are a great motivator for me. Please keep them coming! Never Miss A Post! Subscribe Now! Share book reviews and ratings with Jyoti, and even join a book club on Goodreads. A freelance content writer, a blogger, a homemaker, and a busy mom of a 3 year old. Love to read and cook. My Blog 'Jyoti's Pages' chronicles my cooking adventures, my reading experiences & everyday ramblings.